for nearly an entire minute followed by fires which left the City in ruins and thousands dead. Join us for a reception opening an exhibition of photographs of the aftermath of 1906 Earthquake taken by Irish American photographer & police officer, Charles Fennell. 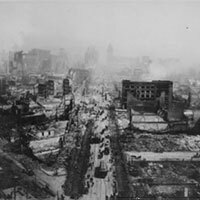 Charles’ numerous photographs were displayed during the 1906 Earthquake & Fire centennial commemoration exhibit at the Atrium Gallery at 901 Market St. Program includes a screening of a video of Market Street two days before the Earthquake and an opportunity to meet members of the Fennel family. Members of the community are invited to share their earthquake stories as told to them by family and friends who survived the Quake. Presented by the United Irish Cultural Center-History/Heritage Committee and the Irish Marvels Past & Present.